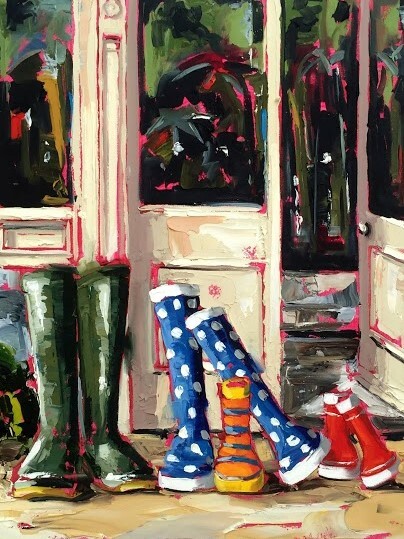 An online course from one of Ireland’s most successfull Artists – Róisín O’Farrell. If you have a passion for art but don’t know how to make the jump from painter to being a ‘real artist’ then this page could be the most important thing you read this year. If you are not sure where to get creative ideas and turn them into paintings then we have a step by step plan for you. 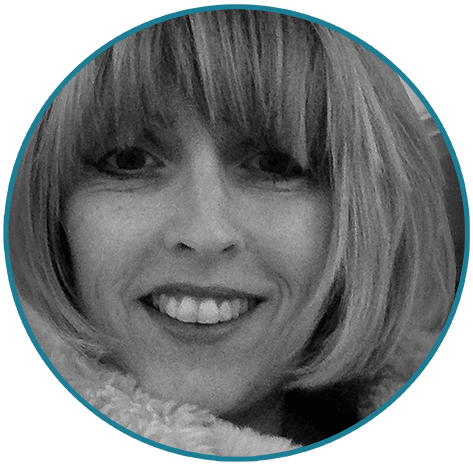 You will learn the exact strategies and mindsets Róisín and hundreds of other women have used to make the transition to producing gallery worthy work. Even though the reasons why you want to be an artist are a complete no-brainer, the process involved in actually becoming one is anything but. But, where the heck do I start? Perhaps in your most courageous moments you’ve made the commitment to start. Perhaps you started, but your busy life or negative comments from others made you stop. Maybe you’ve taken many classes or even an art degree but you never seem to make real progress. Without a super clear, step-by-step plan, most would-be artists get completely lost. They fall victim to paralyzing technique hangups (the experts always make it look soooo easy), a time-sucking sticking point, or lack of clarity over exactly what they need to do next to build their painting process and finish that painting. As an already busy woman with family to care for, commitments to fulfill, and maybe even a day job to get to, you literally can’t afford to waste time. And the moment you get blown off course, it’s almost impossible to recover. And the biggest thing that artists tell me that they struggle with, is dealing with their inner critic. Therefore, building your confidence is one of the few things in your practice that you absolutely NEED. But here’s the good news, against all the odds, your need to create has never left you, (you’re reading this right!) it’s an itch that still needs to be scratched. Even if you’re late to the party, there’s still a golden opportunity for you to benefit from a simple structured process to finally make art that you can be proud of. That is… if you can avoid the same mistakes that most would-be artists are making. I’ve taken everything I’ve learned from building a highly successful, six figure art career and from teaching thousands of artists and aspiring artists, both online and in person, and channeled it into a comprehensive, step-by-step program that not only teaches you the high level theory, but the actual EXECUTION of how you can do the same. But most importantly this program teaches you the missing ingredient in most courses. It teaches you how you can have the heart and mind of an artist. So that you will have confidence in your work and create paintings that are unique to you and have a story to tell. I have created an actionable step by step plan so you can finally call yourself an artist (without cringing inside!). With this program you will have every resource you need, plus you have me and a supportive community (who have taken this road before you) to take you by the hand and walk you through the steps together. 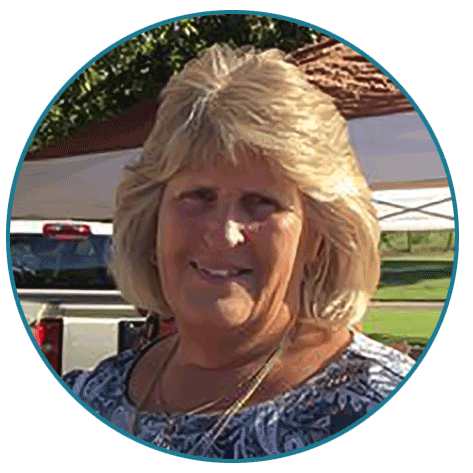 This is the same program I have taught to hundreds of other women just like you so I know I can help you. Success doesn’t come over night but the Love To Paint | Learn To Paint program is structured in such a way for you to see real progress in mindset and technique and start developing within the first 60 days. Everything is laid out in an organized, actionable way that’s easy to understand. So you can jump in and get started right away. Convenient access on ANY device. Love to Paint | Learn to Paint course includes hours of video modules, a Facebook Group and walk throughs. All recorded and integrated into whatever device you like to use, wherever you want to use it (computers, tablets, smart phones, laptops, etc). 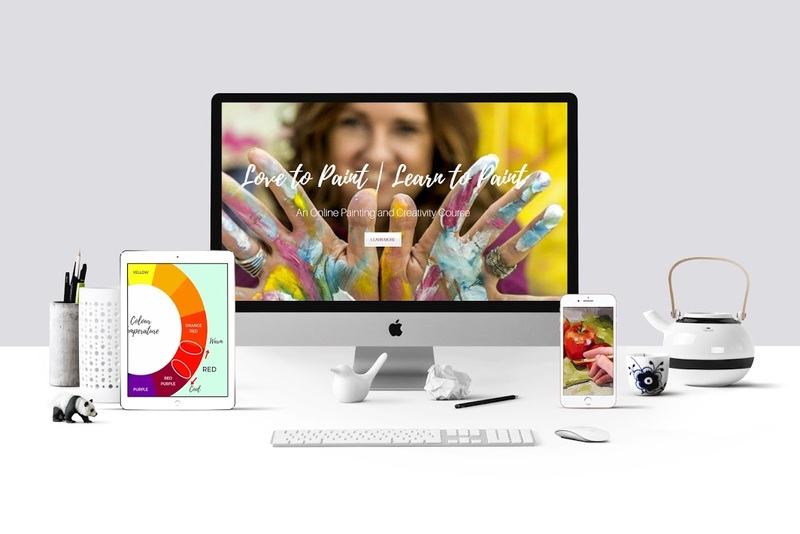 You’ll get access to a private support community reserved ONLY for members of Love to Paint | Learn to Paint going through this creative journey together. Have 24/7 access to a group of peers who are all supporting and helping each other out. If you’re ever stuck, ask your question and get answers from me and the Love to Paint | Learn to Paint community. We’re all better together as we go through this journey. 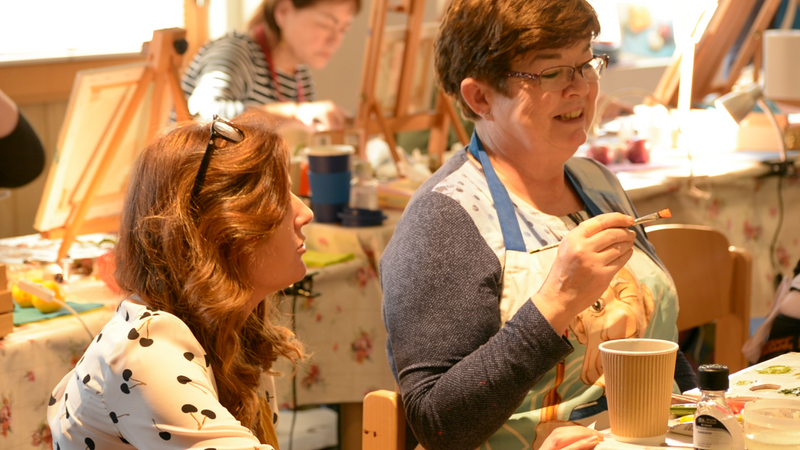 Live group sessions where Ró answers the most common questions about Love to Paint | Learn to Paint, gives feedback on what’s going on in the group and gives additional insights. 18 video tutorials on how to paint quickly and with confidence in oils, with corresponding technical exercises to practice your technique. Step by step, easy to understand, technical knowledge on how to make beautiful art quickly. 6 video lessons on developing your style, finding inspiration and dealing with your inner critic. With corresponding exercises to help you change your creative mindset. The key ingredient in any artist’s development but one most courses miss. 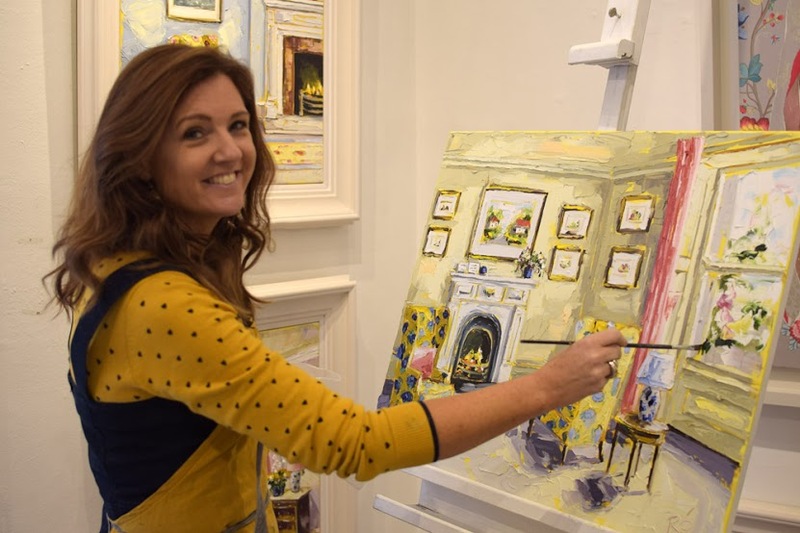 6 full length painting demonstrations with Róisín. See everything you learnt in the first two sections in action which will make it easier for you to implement what you have learnt. 6 corresponding painting assignments for you to do at home. Now it’s your turn, a chance to put together everything you have learnt. Part of this is sharing your work with the rest of the community for insightful and supportive feedback. The confidence you deserve to create paintings that say something about you. Feeding Your Creativity: Practical strategies to find inspiration and feed your creativity in a realistic way. An Interview with Róisín. Why she didn’t go to art school. How she broke through from amateur status to professional Artist. Preparation: Station set up. Paint, Palette and Support. What to use and why and how to clean tools. A Full Painting Demonstration: A simple still life painting using the brush. Plus other activities, resources, podcasts etc. Learning Your Craft: You will learn how to progress your painting knowledge and technique in a practical way. And do it all while living your normal life be it working full time, looking after the family (or both!). An Interview with a Newbie Artist, Lorna Burke: How she dealt with expectations, fears and excitement of starting something new. Composition: The principles of design. Eight invaluable tools to help you create strong composition every time and the two rules every artist should know. You will learn the foundational rules which will apply to every painting you create. A Full Painting Demonstration: A chair painting; painted using the knife. Doing the Work: Set challenging but realistic goals for your artistic practice. We will work on a personalized plan for your development. 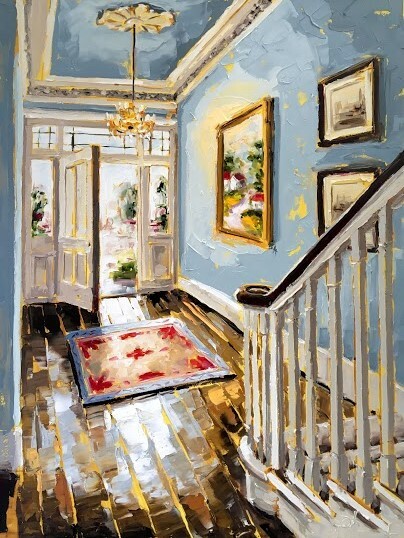 An Interview with Phillip Morrison, a successful artist based in the West of Ireland. How he deals with protecting his creative expression while running a successful business selling his own work. Preparation: We learn techniques to create process sketches to develop ideas and how to accurately transfer our final sketch to the canvas using acrylic or charcoal. A Full Painting Demonstration: A more detailed still life using the brush. Taming Your Inner Critic: Self doubt is what holds us all back from creating our best work. Learn not just how to identify your inner critic but also choose from a number of strategies that counter it. Leaving you free to keep painting. 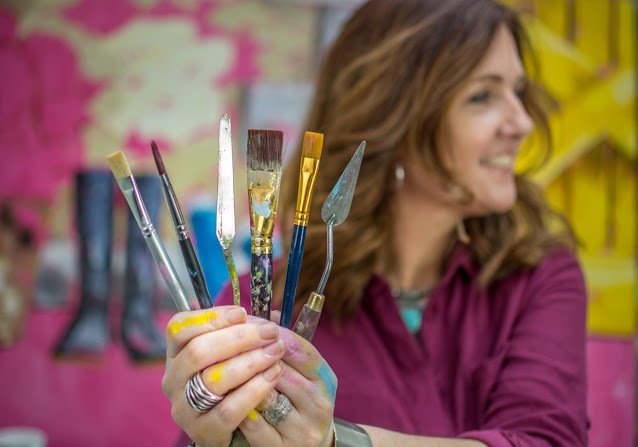 An Interview with Róisín’s Mum, Patricia – Sculptor, Painter and Musician: What it is that excites her now as a fit and active retired art teacher. Colour Theory: Understanding clearly the building blocks of colour theory. Using a split palette to mix any colour. A Full Painting Demonstration: A floral and glass, painted using a brush. Finding Your Voice and Style: How to find your voice and develop your style so your art can finally say what you want it to. An Interview with Vincent Kelly, An Experienced Gallery Owner: Exactly how to approach a gallery as you are an emerging artist. We also cover the most common mistakes people make which stop galleries working with them even when they like their art (and how you can avoid them). Mixing Colour and Value: Techniques for mixing paint and how to accurately mix a string of values for each of the main areas of your painting. A Full Painting Demonstration: A fruit based still life, painted using the brush. Battling Procrastination, Motivation and Getting Organised: Sitting down and doing work is key to being an artist but it’s easy to get distracted or ‘not find time’. You will learn the secrets to dealing with overwhelm, distraction and being busy but not getting anywhere. An Interview with Eíbhilín Crossan, An Emerging Artist and Young Mum: She shares the secrets of working part time while building a successful art career and being a mother. Applying Paint and Evaluation: Techniques for using brush and knife. Simplifying the painting process into three phases. Learn how to evaluate effectively as you go. 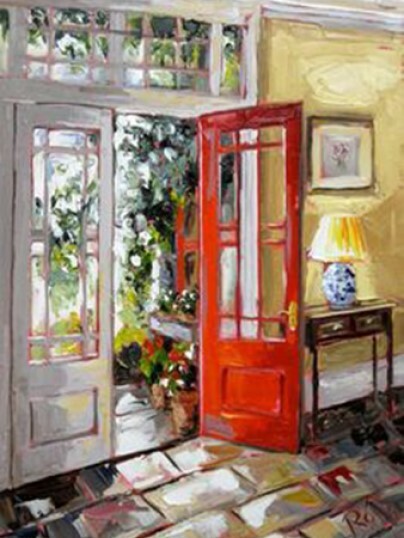 A Full Painting Demonstration: An interior scene; painted using the knife. Plus, You Will Get These BONUSES! Be a part of a tribe of encouraging and supportive artists that have your back and are ready to interact. This is a safe place to share your work, your exercises and your journey through the program. There will also be monthly LIVE group sessions where Ró answers the most common questions about Love to Paint | Learn to Paint, gives feedback on what’s going on in the group and gives additional insights. There will also be additional recorded monthly Q&A sessions. Not a techy person? No need not worry. We’ve got your back here too. We have a vault of friendly ‘walk through” videos to show you how to do everything you need to navigate the course and more. A three step, guided challenge to help you to create an efficient and inspiring work space that inspires you to get painting every time. Join me as I interview five artists and one gallery owner to bring you right into the experience of artists at every stage of the journey. Six curated podcast suggestions to listen to that will fire you up and inspire you and feed your creative well. A video training with practical exercises on how to develop your style. No more staring at a blank canvas. How to find what you should and more importantly ‘want’ to paint. When I talk to my students about why their passion for art got sidelined they tell me about so many reasonable, unavoidable, unselfish reasons. What have you put before your passion to be creative? And when will it finally be your time to paint? To be allowed to get serious about becoming an artist? When the kids are older? When things get a little quieter at work? When my Mum gets better? We all wish that we ALREADY had an artistic practice that brought us joy. But to get to that place, we need to take stock of where we are TODAY and resolve to take the actions that will get us to where we need to go. Otherwise we self-sabotage and stagnate for yet another year. And since you’re reading this, I absolutely don’t want that for you. I don’t want you to look back in a year from now without being proud of your improvements, wondering what could’ve been if you only took action. I want you to have paintings with CONFIDENCE… proud of the new work that you are doing… many of whom you may even have sold! And I want you to thank yourself for the decision you made today. If we haven’t met already let me tell you a little about me. I’m a successful Irish artist, passionate about two things, painting and teaching! I’ve created a dream career from painting colourful expressive paintings, rich in textured oil & that are, in one way or another, about home. I also love nothing more than to teach anyone who loves to paint, how to paint better and how to nurture their creativity. Learning about how to paint better doesn’t have to be difficult… trust me. I know you want to get good. That’s why you’re here! But I want more for you than just technique. I want you to leave your inner critic behind and see that creatively, the world is your oyster! Access the program on any device from anywhere in the world. Not Friends With The Internet? No problem! 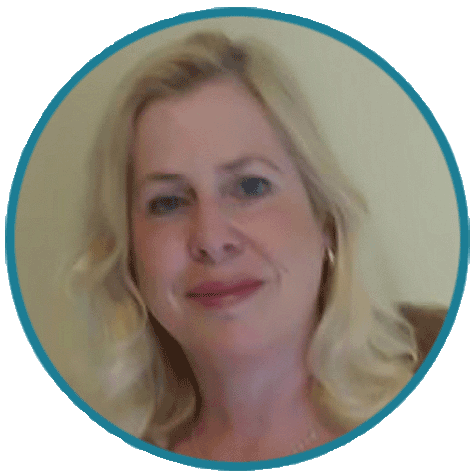 My super friendly team and I are here to guide you every step of the way and with the NEW tech vault bonus we have a bank of simple and friendly ‘walk through’ videos to help make sure you are 110% supported as you navigate your way through the program. And if you do get stuck, (who doesn’t every once in a while), you can email us anytime. We’ll be glad to help. Each one of these courses is valued at $495. You’ll get six modules, video lessons, cheat sheets, resource guides, project plans, and every tool you need to become an artist with confidence and ease. A 12 week guided and supported program with access for 12 months so you can take it at your own pace. The private members (Inner Circle) Facebook Group, The Tech Vault, The Studio Set Up Challenge, six artist interviews, six podcast suggestions and the ‘Find Your Style’ – bonus video training* and the ‘What to Paint’ bonus video training*. You get a full 60 days to try the entire program and if you’re not happy for any reason at all, just ask for your money back. It’s my way of making sure you’re taken care of. My goal is to make you and everyone in our community artists! I know this material works, I have seen it work again and again with my students. I only want to develop the highest quality material based on real world experience and proven results. Results that I’ve seen personally, with people I have taught in person and online all over the world. Go ahead, sign up today and you’ll get instant access to the program. If for any reason you don’t feel it’s a fit, simply contact me or my support team during the first 60 days and I’ll refund you 100% of your payment. No questions asked. Is Love to Paint | Learn to Paint Right For You? There are some people who should NOT buy this program under any circumstances. If any of the following apply to you please do NOT buy this program. If you don’t want to be part of a tribe who help each other grow. If any of the items above describe you, it will probably be best if you don’t buy this program. For everyone else, Love to Paint | Learn to Paint could be exactly what you have been looking for to finally end your frustration and uncertainty and transform your paintings (and your life) for good. Who is Love to paint | Learn to paint for? 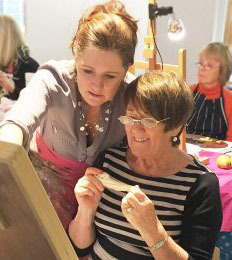 Love to paint | Learn to paint is for anyone who wants to learn to paint with confidence. It’s for committed beginners and evolving artists who want direction, clarity and skills. Who want to develop their own style and voice. And it’s especially for anyone who loves to paint but who battles self-doubt, fear, and wants to create but has lacked the space they have needed in their lives. Who is Love to Paint | Learn to Paint not for? There are some people who should NOT buy this program. So, if any of the following apply to you please do NOT buy this program. If any of the items above describe you, it will probably be best if you don’t buy this program. For everyone else, Love to Paint | Learn to Paint could be exactly what you have been looking for to finally end your fustration and uncertainty and transform your paintings (and your life) for good. Also I teach using the wet on wet technique. If you are particularly interested in learning about glazing and ultra-realistic paintings then this course will not be for you. Also, the subject of painting in oils (wet on wet) is so big I couldn’t possibly cover every area so it’s possible that something you want to know isn’t covered. Feel free to check the what’s in the lessons beforehand and email me. I will be happy to answer any questions you have. 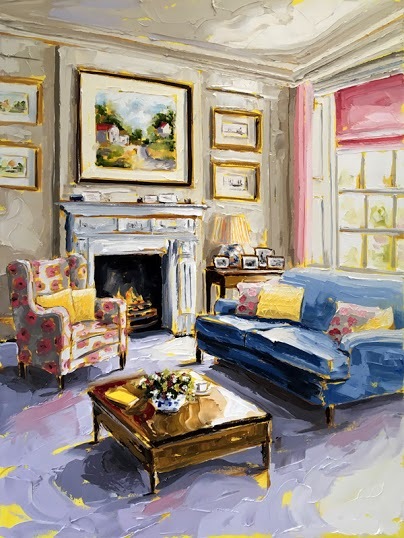 Bottom line – if you are interested in a comprehensive and detailed course that teaches you to paint fast and loose and with confidence then you’re in the right place. Do you offer critique on the course? 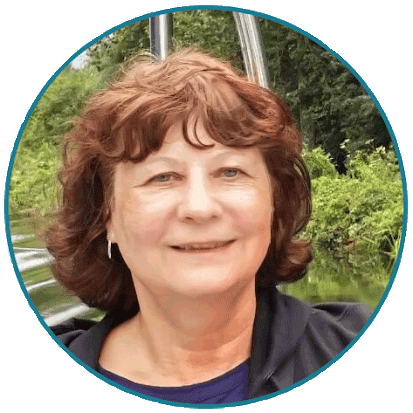 There are too many to individually critic however inside the Inner Circle (private fb group for the course) I will do live sessions, answer questions and use examples (with the owner’s permission) to illustrate common problems for everyone’s benefit. What will happen in Inner Circle Facebook Group and do I need to join that too? Absolutely, during the first 12 weeks as the modules are released I will be in the Inner Circle regularly with video sessions (once a month live and once a month recorded) so you can connect with me and your fellow Love to paint | Learn to paint, Inner Circle members. You can ask questions there, post your paintings from each module, work through the exercises and I will recap on our progress at the end of each module. Once the initial live 12 weeks are complete and all content has been released, I will contine to be in the group as I was in the first 12 weeks and you’ll still have access to the Inner Circle Facebook group with all the videos and to the entire library of training materials inside the Love to paint | Learn to paint member area. You can revisit and review as often as you like for one year. I recommend between 1-2 hours per module to watch the course content. I recommend you allocate 2-4 hours to complete a painting assignment in each module and 1-4 hours for doing the exercises. Naturally, the more focus and dedication you put into the course Learn to paint | Love to paint, the more you’ll get out of it. But if you’re not able to carve out that much time at first, don’t worry. Many of our students go through the program as best they can, pause and return to it as their schedule allows. And of course you can run through the course as many times as you like in the year. Can I take the course at my own pace or do I have to keep to a schedule? You have a full year of access to the training, so you can go through the modules as they’re released, or you can slow things down and work on your own schedule. So, if you’re working a full time job, juggling commitments, having a baby, traveling around the world, or dealing with any big life events during the live 12 week program, don’t worry about falling behind. You can revisit and review the training materials any time over 12 months from when the first module is released to you. The Love to Paint | Learn to paint course is not accredited to any educational institution and is a stand alone educational resource. However a certificate of completion will be given. What painting technique do you use and teach? I paint using the wet on wet technique or alla prima and I teach this technique in the Love to Paint | Learn to Paint course. What is the Wet-on- wet technique? Who is this Róísín O'Farrell person and why should I listen to her? I’ve spent 15 years teaching in business before starting to teach artists less than a decade ago. I have been walking the walk as an artist for almost ten years and exhibiting in established galleries in Ireland, the UK, Europe and the US. Hundreds (probably thousands) of students and customers later, I’ve taken everything I’ve learned about painting and being an artist and streamlined it into a series of lean and actionable courses, the first of which are now available right here. What computer equipment will I need to complete the course? You will need a laptop or desktop computer or you can use a tablet. Many do the majority of the course on their phone. You will need a printer if you would like to print off the handouts, although they can just be viewed on screen if you prefer. You will need headphones or speakers headphones to listen to the podcasts. I have never painted before in my life; would I be mad to take this course? Not at all, this course is perfect for complete beginners who are hungry to learn and you have a full year to complete the course if you need to take it slow or to revisit areas at your own pace. I paint in acrylics. Will that work for you course or is it strictly oil? I am a fairly well established artist; would this course suit me? Every year I have established artists take my workshops. Some work are used to working in a different medium to oils and want to explore a different medium. Some feel the need to revisit the foundations, some are feeling a little blocked and want to focus of something different and some simply enjoy the process of learning and painting with others. In art, we never stop learning! Either, way, you are most welcome. I'm hopeless with computers, will I be ok? We’ve had an octogenarian complete the programme who had never studied anything online before. You’ll be fine. If you do run into any problems you can email us. There is also the tech vault which is a bank of short frendly ‘walk through’ videos to help you with most of the main things you will need to know. And you can email me or the team anytime if you have any problems. I’m hearing impaired, can I take the course? If you can hear the sound from videos on your computer or through headphones then you will be fine. However, the Love to paint | Learn to paint course is 75% video sessions and it is not possible at this time to offer subtitles. What are the technical requirements to do your courses? Level – Easy peasy! You need to be able to watch videos, with audio, access the internet, download PDF’s and open them. If you are comfortable using Facebook and Youtube you should be good to go! Are there any educational requirements to take this course? No, you don’t need to have any previous art education to benefit from the Love to Paint | Learn to paint course. However, you might like to take the free Honest Truth Masterclass to get your foundations prepared for getting the best from this course. You can pay by using PayPal or by credit/debit card. And you can choose to pay in one payment (Best Value) or over 3 equal installments over 3 months (Easy Pay). Certainly, you can pay using VISA, MasterCard, and most major Credit or Debit cards. Yes. I’m happy to offer a 100% satisfaction money-back guarantee. Here’s how it works. Participate in up to the first 60 days of the Love to paint | Learn to paint course from the start of the live program. If you don’t feel we’ve delivered on our promise within those Modules, send me an email. And i’ll give you a 100% refund (bar bank fees), with no quibble. The refund deadline is 60 days from the purchase of the programme. If you don’t plan on starting right away, make sure this is the right investment for you as the refund period does have a firm deadline. I see you say Courses, how many do you have? Bear with me, I’m working on it! I have a free Masterclass and my signature course, a Six week Painting Course called Love to Paint – Learn to Paint. With the wind behind me I hope to have further offerings soon! 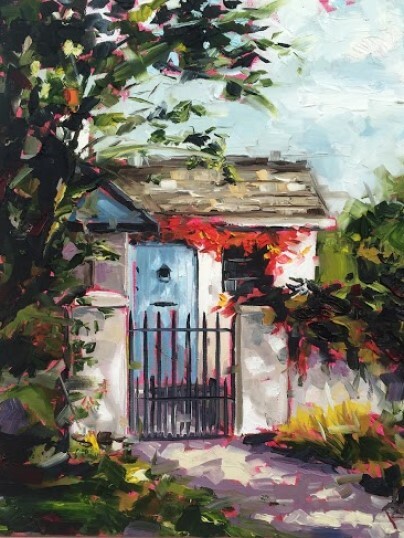 In the meantime, check out my blog for lots of good stuff and my Facebook group love to paint with Róisín O’Farrell for mini training’s, challenges and encouragement. Is this the same stuff I can find on the internet for free? No way. I was very conscious of that when designing my courses. Obviously the internet has a huge amount of information, so to say that none of the info provided in these courses exists anywhere else would be madness. If you search “learn to paint” on the Internet, this is not the only place in the world discussing it…. However, my courses are geared to teach you relevant and reliable information. They are a one-stop shop so you don’t have to endlessly scroll blogs, wondering if the info is correct. Furthermore, what and how I teach in my courses is what really sets my courses apart from the rest. The Internet can be an information overload, especially when it comes to art and painting. Often, there’s no context behind the info and much of it is overly generalized from teachers that aren’t full time artists. Your Masterclass is Free, does that mean it's old stuff or not your best training? I’m a big believer in giving away your best stuff. What goes around, comes around, right? And when I sat down to think what is the very best advice and practical training that I can offer to artists, I knew exactly what I wanted to say. If I can get across the message of this Masterclass to Artists, I know it will change everything for them just like it has for countless artists that I have taught in ‘real life‘. ABSOLUTELY! I’m based here on the east coast of Ireland but the information in these courses is for anyone who loves to paint. I may have an Irish accent and use some funny (to you) expressions but I’ve taught in Europe and the US and let me tell you, we artists are just the same wherever we live! Shoot me an email and my team and I will reply within 24 hours. Email me at hello@roisinofarrell.com and I’ll be happy to help.